International Convention 2018 will be taking place in Wroclaw, Poland from 3rd to 6th of June 2018. CILT International Convention 2018 will focus on the key issues of Linking CEE to the World, The Electric Car Revolution and Its Impact on Logistics. Delegates will enjoy an exciting 4-day programme including International Guest Speakers, Workshop and interactive sessions, the Women in Logistics and Transport Conference, the Young Professionals Conference, and opportunities to be involved in shaping the future of our Institute and our Industry. Dr Marcin Pawęska, the President, CILT - Polska in an in-depth interview about his vision for International Convention 2018. It’s pronounced “vrotz-laf”. Dr Marcin Pawęska, President of CILT Polska and Rector of Wroclaw’s International University of Logistics and Transport, does not correct me. No doubt used to poor foreign pronunciation of Poland’s fourth largest city, he is already a few sentences ahead, speaking clear, accented English very quickly. I ask for a little personal history and he breezes through his biography – school in Poland followed by a BA and an MA in Business Administration from Erasmus University, Rotterdam, a PhD in Risk Management from the University of Žilina in the Slovak Republic, and perhaps most telling of all, an MA in International Relations from the University of Economics in Wroclaw. This international outlook is reflected in his professional life. 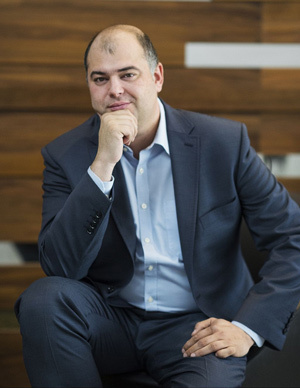 After completing his studies he spent five years in the UK working for global consultancies, before returning to Poland in 2009 to manage a logistics consultancy firm advising private logistics companies as well as local, regional and central government. Since 2015 Marcin has been a member of the Mobility Council advising the Mayor of Wroclaw on city logistics. Over his career Marcin has also managed numerous research projects in logistics and transport, and continues to publish frequently in scientific journals both in Poland and abroad. Between 2011 and 2014 he was appointed one of five regional leaders of the logistics and transport section at the Polish Academy of Science, and in 2017 he was appointed a Visiting Professor by Ningbo University of Technology, China. I take the opportunity to ask how he first became involved with CILT. “From one side working in the best logistics university in Poland, and from the other running a quite successful logistics consultancy, one day I just picked up the phone…I was looking for a reliable partner to strengthen the presence and internationalisation of logistics in Poland.” Following that call were a number of direct contacts, meetings and joint activities, ultimately leading to the formation of CILT Poland on the 3rd of October 2012. It is a partnership that Marcin sees as greatly beneficial to the wider Polish logistics and transport industry. “A key thing about the institute is at one side it is very broad, and at another it is very specific.” He refers to a project currently open at his desk, “I’m reminded by the metro map in front of me, when I or another CILT member in Poland is looking for an expert in a certain field, it’s very easy to locate one. CILT covers all industries and functional areas…I’m also an academic. In addition to a vibrant academic community there’s the Knowledge Centre (Europe’s largest collection of logistics, transport and supply chain resources, maintained by CILT. I don’t think I’ve come across so wide a range of articles”. Central and Eastern Europe is not easily defined, with both politics and geography playing a role. It usually refers to the Eastern Bloc countries west of the post world war II border with the former Soviet Union, as well as the independent states in former Yugoslavia, and Estonia, Latvia and Lithuania, the Baltic states that chose not to join the Commonwealth of Independent States (CIS) formed during the dissolution of the Soviet Union. The Organisation for Economic Co-operation and Development (OECD) defines the group as Albania, Bulgaria, Croatia, the Czech Republic, Hungary, Poland, Romania, the Slovak Republic, Slovenia, Estonia, Latvia and Lithuania. Other organisations sometimes include the NATO states of Bosnia-Herzegovina and Montenegro, as well as Serbia and Macedonia. The interview was conducted by Jasper Cook.